Special Players Pack item for the first 50 registered! We’re keeping it a secret for now but just know that it’s super cool and you won’t want to miss out! Only 50 available so register now! Get more information and schedule on the event page here. Please consider bringing your daughter or other female family member to join the fun and make memories together! You could also share the event with a friend that has a daughter. All Juniors divisions are just $20 registration fee and no PDGA fee is required. I am pleased to announce a new women’s series right here in the Midwest: the Heartland Women’s Disc Golf Series! 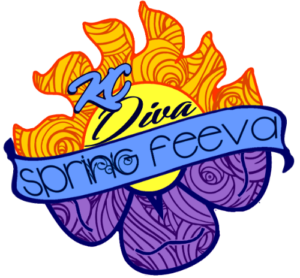 I founded the Kansas City Disc Golf Diva’s league in 2011 and following that success we hosted the first annual KC Diva Spring Feeva event in 2015. In 2016, it was also a Women’s Global Event (WGE) and we filled our event with 89 players, the second largest Women’s Global Event overall. I say this to point out the promising growth we’ve seen in women’s disc golf here in the Kansas City area. It’s been on my heart to expand our reach and spread the love to more women, especially in the lower Midwest states. This past November while attending the Director’s Cup in Indiana, I had the pleasure of meeting PDGA Women’s Committee member, Erin Oakley. In chats with Erin, who is also the organizer of the Midwest Women’s Disc Golf Tour, I was inspired to take a leap of faith and move forward. The Heartland Women’s Disc Golf Series was born!  Teaming up with ladies from other states, our mission is to plant the seeds and provide support and resources to grow women’s disc golf leagues and events in the lower Midwest states: Kansas, Missouri, Nebraska, Iowa and Oklahoma. The 2017 schedule is below. We hope to add more events soon. Please contact us if you are interested in hosting a women’s only event or even starting a women’s league in your area. We don’t have all the answers but we’d be happy to share tips and our experience with you. Be sure to like Heartland Women’s Disc Golf Series on Facebook! 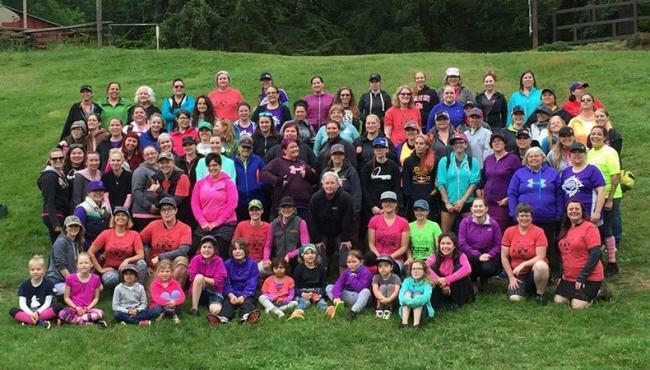 In celebration of National Girls & Women in Sports Day on February 1, 2017, the PDGA Women’s Committee will be hosting the first ever, PDGA Women’s Symposium. Tune in and learn more about women in disc golf and how you can support and help grow the sport! Help Support Our Team and Right to Play! The Kansas City Ice Bowl, hosted by the KCFDC is held every year in January and this marks the 29th year. It has grown to become the largest locally attended disc golf event of the year and you don’t want to miss out. Its purposes are raising funds to fight hunger, having fun, and connecting our Disc Golf community in a positive way to the community at large. 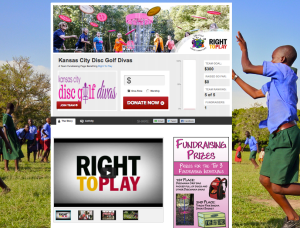 Kansas City disc golf community has raised over $67,000 in support of the hungry. Our supported charities are the Bishop Sullivan Center’s St James Food Pantry and Harvesters: the Community Food Network. 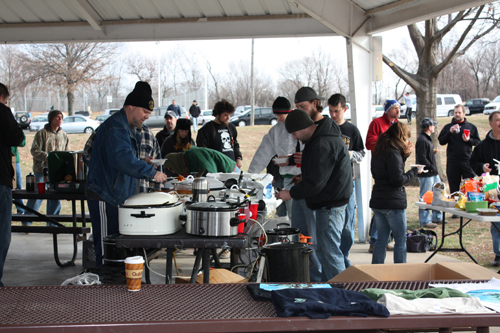 Last years Kansas City Ice Bowl raised a total of $8,000 that was divided between the two local food charities. The KC Ice Bowl tied for 6th for the most money raised out of 208 events. The final player/donator counts was 401 people, 325 of which played at least one round. We are attempting to raise $10,000 this year – come out to support and have a great time! Steve Dresser is the 2015 Ice Bowl Champion. The KCFDC is continuing its drive with the additional satellite events taking place the weekends prior to the final Ice Bowl, similar to what was done in 2015. We are splitting up the event across 3 weekends for the best fund raising opportunities as well as giving players multiple shots at posting their best score while playing their home/favorite course. Main Event, Final 9, Silent Auction, Chili Cook off and more! Bring Chili or other goodies to share. We will continue this year with our traditional chili cook-off. We are asking you to have your entry at Swope by 10, judging will begin at 10:30. The club will provide drinks and condiments, but as always, we need more food to so that we can feed everyone. – taken from the official Ice Bowl HQ website, maintained by the Ice Bowl instigator, Rick Rothstein . annual event that would eventually raise over $3 million in charitable contributions, specifically targeted to fight hunger and feed the hungry. Check out the full Ice Bowl History PDF that includes many more details such as the snowiest events, the coldest events, the events that raised the most money. 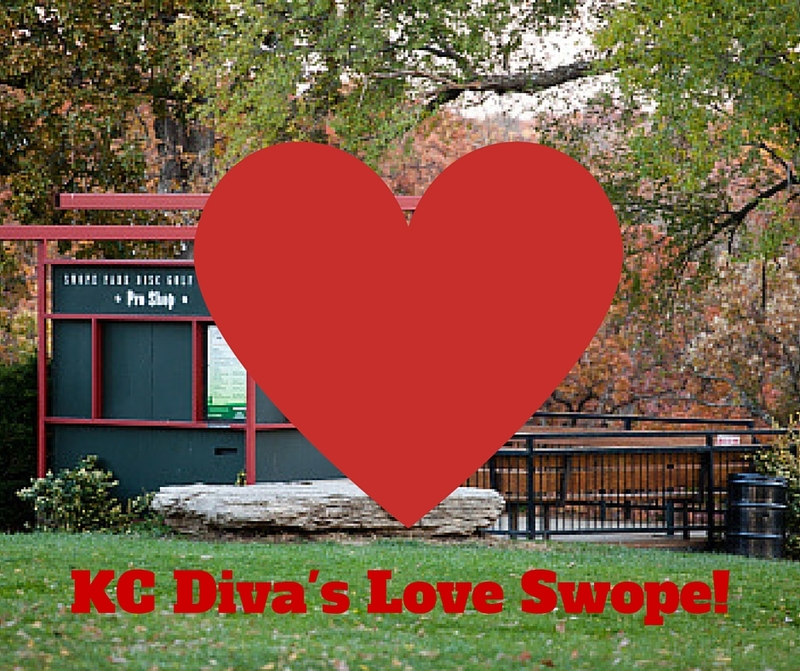 Join us for KC Divas Holiday party! We have changed the time of the event in order to take advantage of 10$ bottomless Bloody Mary’s, Mimosas and Poinsettia’s, Drink specials are only available till 2pm with the purchase of an entrée. Brunch and Lunch menus will be available. White Elephant gift exchange. $20 or less. Craft-Mart: Share your favorite craft or hobby. What do YOU make or create with your own hands?! Share Christmas gift ideas etc. Disc Swap: Bring any discs you’d like to trade. 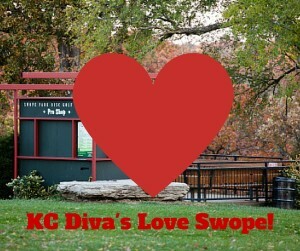 Spouses/significant others, and KC disc Golf Divas supporters and volunteers are of course welcomed. Swope Park Disc Golf course is my favorite in the city and what I call my home course. It’s beautiful year round but especially beautiful in the spring and fall. You put this amazing piece of property with such rich history in the hands of Patrick Smith and Gary Birge (and other workhorse volunteers over the years) and you get to be privileged to play on a course like we have today. We’ll be starting a beautification project in front of the clubhouse and planting a flower garden. Can you imagine how beautiful it will be this spring for Diva Feeva?! Do you have a garden at home that needs some thinning out- this is the perfect time. Bring anything from your own gardens you want to share. We’ll also be planting bulbs. Bring your gardening tools if you have them too. We’ll be decorating the pine tree near #3’s basket for Christmas. Please bring out any extra decorations and ornaments you don’t need or maybe were thinking of donating/throwing away. Both of these project will happen at Swope before league at 1pm. Any questions, let me know in comments below. In support of Growing the Sport, why not bring your family out for a fun day of disc golf. This is not just for the competitive golfer. It’s an opportunity for kids to play tournament golf that is geared exclusively for juniors, but any skill level is encouraged to play. It’s one round and the kids are divided into 5 different appropriate age groups. Raffle and other prizes throughout the day, CTP and Ring of Fire. There’s also a BBQ lunch served. A majority of the event proceeds are donated to United Way. Bill Lentz, the Fox Hill P.E. teacher and tournament co-director’s goal every year is to raise $300 for United Way. 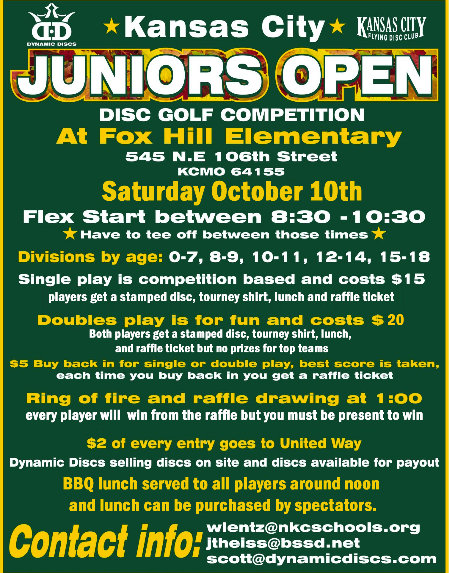 Fox Hill has hosted a Frisbee tournament and disc golf event in KC for numerous years and we hope to continue growing this event and raising money for United Way. The flyer states that is the 3rd annual KC Juniors Open, but this event started as a frisbee and hula hoop event fundraiser for United Way is one of the longest frisbee events in KC’s rich history going steady for 24 years. I recently had a conversation with John to get his thoughts and perspective on growing the sport and how he sees the future. 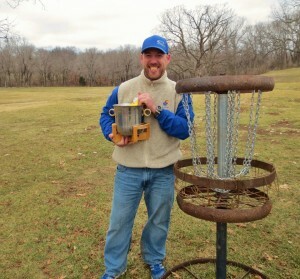 He had great advice to share and ideas on promoting disc golf through school programs and more. Where do you see the future of disc golf heading? John: The future of disc golf will grow exponentially once disc golf becomes part of our state PE curriculum. In my short time playing, I have seen tremendous growth and change in our sport. There have been changes in how events are run locally, more events are available now than ever, and new courses are popping up everywhere. All of these changes are great and point to growth, but the real growth occurs once all children have been exposed to the sport. Disc golf must be a mandated activity for physical educators to teach. When kids are introduced and instructed in schools, it provides a sense of legitimacy that varies from parents dragging their kids out and trying to teach them. You have a real passion for promoting our sport to kids. What lessons have you learned and advice can you give others that might have the same passion? John: My passion is all things related to disc golf, but not strictly promoting it to kids. I am very fortunate to have a profession where I am able to impact disc golf, been privileged to design, and able to instruct thousands of students. With my main professional P.E. goal of promoting lifetime fitness, disc golf is an activity that aligns perfectly. Youth are an untapped population in the disc world and anyone can make a huge difference in this group, not just P.E. teachers. YOU can make a difference and one does not need to be a P.E. teacher. Do not wait for someone else to do make things happen at your local school. Team sports are fantastic and our country embraces team sports, however, team sports are not for everyone. I witness large percentages of my student population struggle with traditional team sports. Disc golf provides opportunities for full inclusion and teaching a disc golf lesson is one that encourages everyone to be active and engaged. All students have a piece of equipment versus waiting around or watching. All physical abilities can participate, those with poor hand eye coordination or foot agility can achieve skill progression and mastery, and my student in a chair is able to throw rollers as far or even further than his classmates. Disc golf levels the playing field and students can quickly progress, master skills, and interact together in cooperative but competitive environment. We’d love for you to share more about how you went about putting in the school courses. Tell us more about your experiences and how you were able to make this happen. Having permanent baskets was important for me and I wanted my students to have real baskets to utilize in class and outside of class providing families and students a place to play after school. Fold up baskets are great for some teachers, but lugging them out and setting them up takes some prep time and over the years they start to show wear and tear. I was passionate about installing permanent baskets for my school (but the price was a big factor) and luckily one year our PTA donated money for our 4 hole course designed on a perimeter loop of a field. My passion for school courses did not stop at my school and I continued to push and have since put in numerous baskets at schools using the DB-5 from Lightning Golf Discs. From my experiences, schools can be easier than parks departments to get courses installed. I have worked with various park departments and two school districts, but I have found schools are more willing to approve the project and have less bureaucratic measures and red tape slowing you down. The biggest hurdle with schools is money. However, you can write grants, ask the PTA to earmark the money for this year or next, sell tee sign sponsorship, do a walk-a-thon or exercise -a-thon to raise funds. 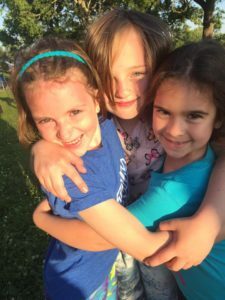 I have written several grants and it can be a very difficult process to find outdoor grants that are not specifically geared towards S.T.E.M. (science, technology, math). Do not get discouraged when searching for grants, writing grants, or working with schools to convince them to install a course. Schools often have some of the best overgrown and neglected spaces between sports fields and buildings that are just waiting for you and your energy to install a course. Once one school installs some baskets, often times the other P.E. 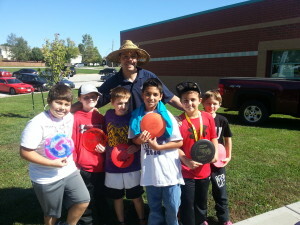 teachers in the district will jump on the disc golf band wagon and the domino effect has begun. If you teach elementary school or want to get a disc golf program started at your child’s school, finding the right discs are also very crucial. Students need to feel successful and experience skill mastery in order to stay engaged. I recommend that you call a manufacturer and ask them to mold your discs as light as possible. If you do not get the answers you want, call around. Someone will be willing to help you out today since the market has so many new companies. When working with elementary kids, I use weights starting from 117g to 150g. Most of my students in grades K-5 stay in the low weights of 117g to 130g until they are turning them over. I know that sounds super light, but if you purchase a stable disc, they fly predictable and have great glide. I also look for a plastic that has some flex so they are not as stiff in case they make contact with other students. I tend to go with an approach and putt disc that has some flex. Discs that have beveled edges are too dangerous, even mid ranges discs are too firm on the edge and can be pose safety issues with errant throws. Go with a slower lightweight flexible disc that they can control. I would also like to see the Matching Baskets Program thru the Disc Golf Foundation be offered to elementary, middle and high schools. After building two 18 hole courses at schools that required numerous resources, funding was our major obstacle. How many colleges or universities are hurting to muster up the funds required to purchase 18 baskets? Many universities have large activity fees focused towards building massive student rec centers. For 1/10 of 1 percent of the cost to build a rec center, universities could build a disc golf course. We need to get more permanent courses in at schools and the cost of 9 or 18 baskets is quite large when considering other costs for installing a course. I believe that when elementary, middle, or high schools have the adequate space and interesting terrain and features, they should have an opportunity to be considered for Matching Baskets. Disc golf grows when more students have a access to it thru the instructional approach of a teacher versus being exposed to the sport on college campuses. In addition, schools need help from basket manufactures by providing affordable permanent outdoor baskets. Businesses must make a profit, but it would be nice if schools were given wholesale basket prices that are offered to retailers. Some retailers may be upset by this notion, but if you have a course nearby, that will drive more business into your store. I have had two different store retailers (Disc Golf World and Discs Unlimited) sell baskets barely above their cost for my school courses. Schools should be able to buy baskets at wholesale prices. This enables schools to have extra resources for tee signs, tee pads or for machinery needed to clean and clear land. So the revenue problem, in my opinion, can be handled two ways to help grow the sport. Matching baskets for all schools that qualify (with appropriate land for 9 or 18 holes) or cheaper basket pricing for schools. Want to help GROW THE SPORT? Do you have any advice or ideas to share? Please leave your comments and feedback below.